Ready to become a CPA and apply for the CPA Exam, but not sure where to begin? We completely understand! With 55 Boards of Accountancy that you could apply to and numerous details that make up each step, the process of becoming eligible to sit for the CPA Exam may seem a little overwhelming. But, before you can even apply to take a section of the CPA Exam, you must be declared eligible. Here’s where our new Pathway to CPA Exam quiz comes in handy! 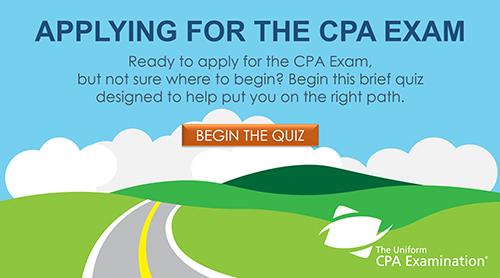 While taking this quiz, you will be asked a series of questions that will help put you on the right path to beginning your CPA Exam journey. User-friendly for both domestic and international candidates, this is a unique tool that will make your start to becoming a CPA a little less overwhelming. Best of luck with the entire process!